It seems like most of us expect futuristic technology to be like it is in the movies: outrageous, over-the-top and totally life-changing. Sometimes it is – but usually technology advances in small steps. That is precisely what the LOPES system is about. The robotic exoskeleton legs help stroke victims learn to walk again by supporting them as they walk and giving real-time support at any weak spots in their gait. 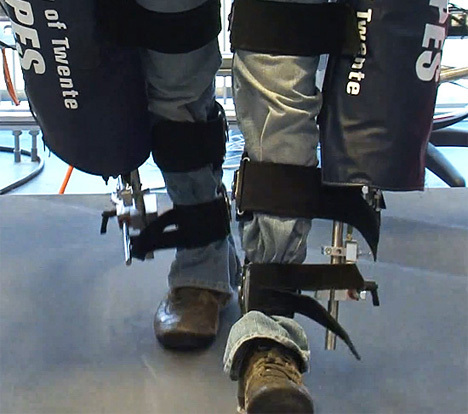 Developed in the Netherlands at the University of Twente, the LOPES is used with a treadmill to help rehabilitate patients. Unlike other devices that look similar, the LOPES is able to move in three dimensions, giving the user a much more natural range of motion. It is currently still in development, but the team behind the exoskeleton hope to have it available to rehab clinics and hospitals by the middle of 2012. See more in Cybernetics or under Technology. November, 2011.